A little background before we get on to either Mrs Heaton or why I think this picture is just appalling. When Rossetti married Elizabeth Siddal in 1860, he swore off all the other models that had caused such friction in their relationship. Rossetti's watercolour style had taken a radical re-think in 1859 with Bocca Baciata, which was a single subject celebration of womanhood. Siddal had been absent from Rossetti's life when this reinvention of his art had taken place, but when she had returned so triumphantly and they had been married, Rossetti crowned her in the new style, as if to say she was the only one he needed both romantically and artistically. This is neither the time nor the place to discuss what a feckless git-weael Rossetti was, but obviously we all know that those vows did not stick and before the first anniversary of the marriage, Rossetti had brought back the other models, and Elizabeth Siddal was no longer exactly queen of his heart. In 1860, it is recorded that John Aldam Heaton (1830-97) and his sister-in-law Ellen visited Rossetti from Bingley in Yorkshire. Mr Heaton was a furnishing manufacturer and Ellen was already a collector of Rossetti's drawings. Mr Heaton then commissioned Rossetti to do 3 small stained glass panels for his home, including one of his wife as the 'Lady of Woodbank'. 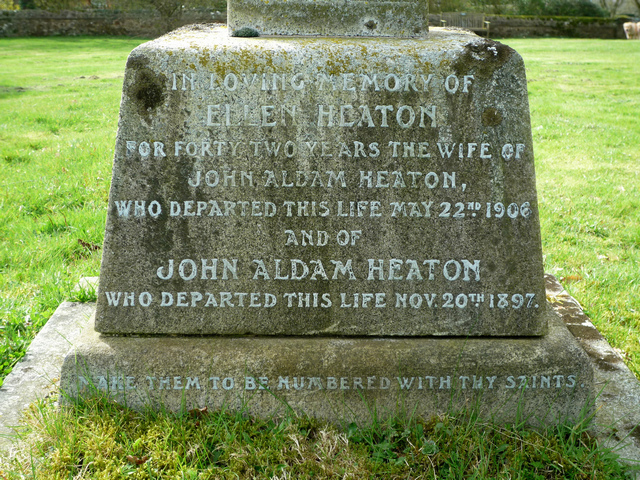 To start unpacking those facts you have to understand that the Heaton family of Yorkshire is quite large and as far as I can see the 'Ellen Heaton' was not John Aldam Heaton's sister-in-law but possibly a cousin or aunt. Ellen Heaton (1815-1894) was indeed a prolific collector of Rosseti's work as well as a women's rights campaigner and member of the Kensington Society. If it was this Ellen Heaton who visited with John Aldham Heaton, then it would make sense that she was possibly making the introduction, being already acquainted with Rossetti. However, John Aldham Heaton's wife was also called Ellen, so the Ellen Heaton who visited with John Heaton could well have been his wife but understandably mistaken for the other Ellen Heaton by subsequent biographers. Morris and Co. were working up in Bingley at that time and Ruskin was lecturing in Bradford, so Rossetti went up to Woodbank in Harden near Bingley (just handy for a garden centre and the Golden Fleece pub). Mr and Mrs Heaton had married in 1855, and had two daughters Winifred (1856-1929) and Monica (1858-1944). 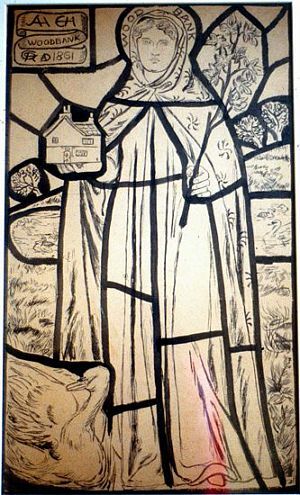 Rossetti designed the stained glass panel, seen above, with Ellen Heaton as a saint, holding the house in her hand. 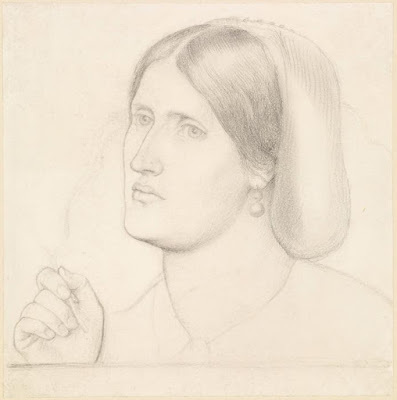 Whilst staying at Woodbank, Rossetti also seems to have started another canvas, this time a portrait of Ellen Heaton in a style that he would echo over and over again during the 1860s and 1870s in works such as Il Ramoscello (1865) and portraits of Ada Vernon, Aggie Manetti and others. I like the pencil drawing of Ellen Heaton and had the portrait been closer to the drawing than copying Regina Cordium so completely, it would have been a fine work. 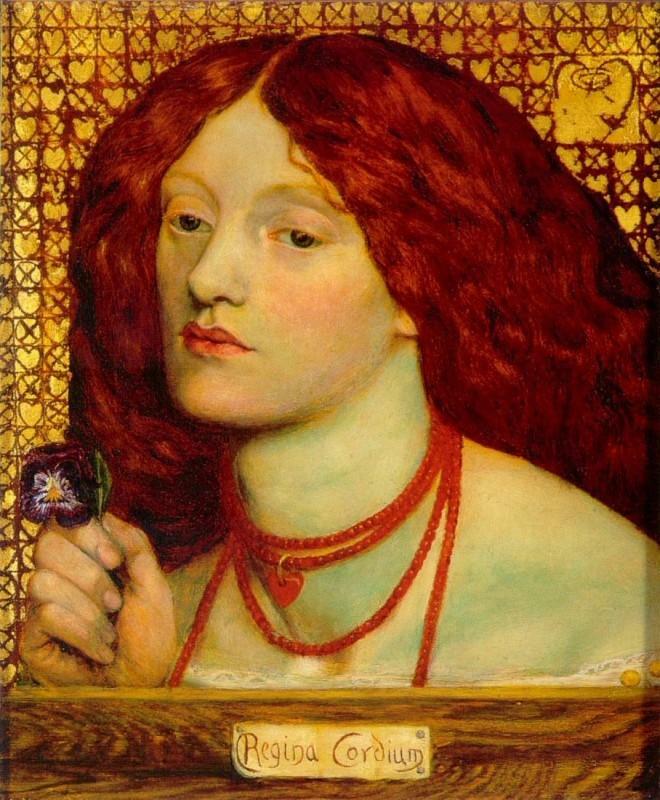 However, for some reason Rossetti allowed the painting of Ellen to become a copy of the wedding portrait of Lizzie. The problems with the painting are mainly emotional, but I don't think the handling of Mrs Heaton's face is particularly flattering. The image of a wan Lizzie holding a fragile pansy seems awkward when applied to the very healthy looking, somewhat uncertain Ellen. Lizzie's downcast, lashless eyes are unearthly, but Ellen's slightly perturbed stare are very much of our world. 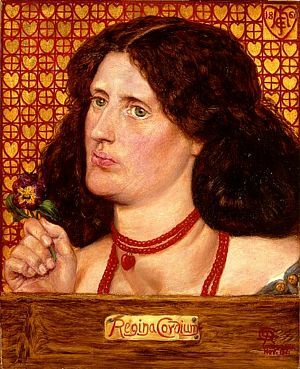 I'd like to think her shrewd, dubious gaze is the look we'd all give Rossetti when told to sit there holding a pansy. Ellen Heaton is all of us. Interestingly, there is a letter from Rossetti to his mother from this time, worried that he had heard Lizzie had left William and Jane Morris's home where he had left her, and returned to Chatham Place, where there wasn't any money for food. He states that he could not have her travel to him as they did not have the money for such a journey, but if he was allowed to work, he would have 50 guineas from the Heatons by his return. The dubious portrait of Ellen became a stained glass window, it is reported, one of the first made by Morris & Co, but I don't know if that is as well as or instead of the image of the Lady of Woodbank. I have a healthy respect of Ellen Heaton as her story is an interesting one. Born in Brighton in 1826, daughter of George Morley, Ellen went to work as governess for the Horsfall family who owned Burley Hall, near Leeds in Yorkshire. Seeing a photograph of the place I was reminded of the sort of wide gray building that governesses were slowly driven mad in by demonic off-spring of the Yorkshire aristocracy. Really, it's just The Turn of the Screw waiting to happen. Mercifully she does not seem to have been there too long, as she married John Aldam Heaton in 1855 and the daughters followed. 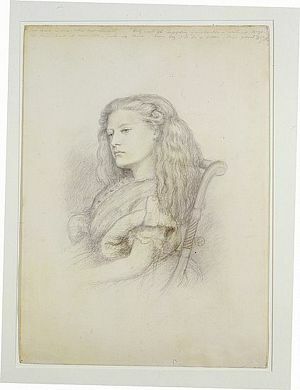 While Rossetti was staying with the Heatons in 1861, he also did a portrait of either Winifred or Monica Heaton. It was passed through Monica's family, inferring that it's Monica but as she was only 3 years old at the time, it would seem to be her older sister. Mind you, Rossetti said the picture was not a bit like the child and he only gave it to Heaton because he guessed the child's father would not want it burned. 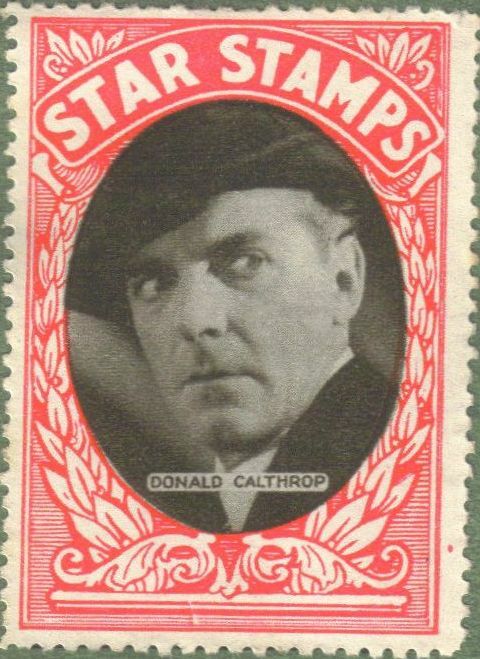 Rambling but interesting fact, Monica's daughter Margaret married Hitchcock actor Donald Clayton Calthrop. Anyway, not long after the work was done for Woodbank, the Heaton family moved to Queen Anne Street, Cavendish Square in London. 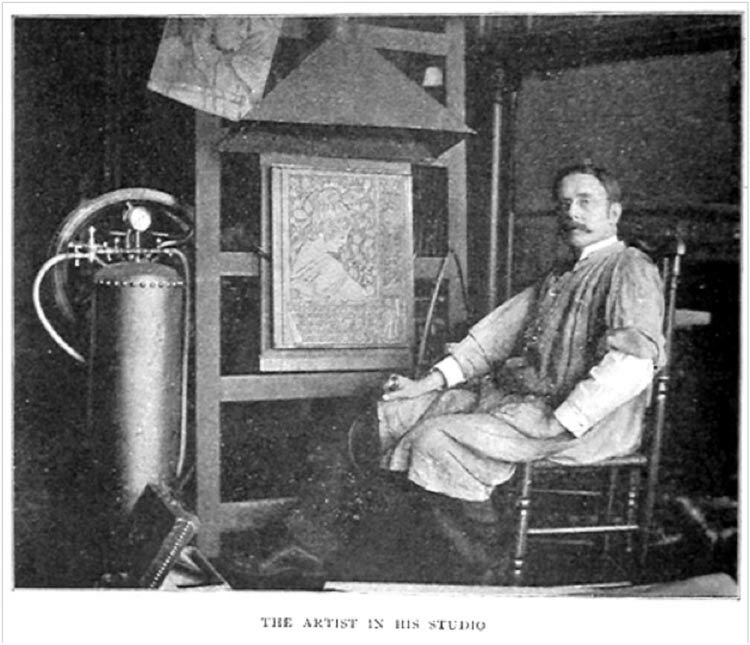 There is an interesting page here on some of Heaton's work. John Aldham Heaton bought other Rossetti works, buying Silence from Rossetti's dealer while he was in Scotland in 1872. However, Heaton and Rossetti fell out in around 1874, possibly because Heaton's own company Heaton, Butler & Bayne Co became competitors to Morris & Co. William Michael Rossetti recorded that the argument had been ferocious and although he felt his brother was in the right, the length and strength of the grudge he held against Heaton was disproportionate. However, Heaton was recorded attending Rossetti's funeral and William Michael was relieved to be reconciled with a former friend over the grave. John Aldham Heaton, architectural-decorator, died 20 November 1897, leaving his family £24,000. Ellen moved to be with Winifred and her family and died in 1906, aged 80.